A: When frigid weather persists for days on end – like those way-below-zero temperatures – a pond can completely freeze over, even if a higher-watt de-icer and aerator are used. The ice-melting combination works great in most scenarios, but it just can’t keep up in extreme conditions. Do keep in mind that pond de-icers are not meant to thaw the entire pond’s surface or heat the water. Their primary purpose is only to keep a hole in the ice to allow gas to escape. With that said, if your pond has been totally frozen over for a day or so, your fish will be fine. But if it has been more than a few days or weeks, your pond pals could be at risk of oxygen deprivation or overexposure to dangerous gases trapped beneath the ice. With several more months of winter ahead of us, it’s not too late to add a de-icer to your pond if you don’t already have one. Simply place a unit, like the K&H Thermo-Pond De-Icer, on the ice and turn it on. It will heat up and melt through the ice – as long as temperatures aren’t too extreme! For an extra boost, pair your de-icer with an aeration kit. 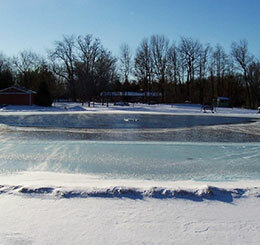 The bubbling action also disrupts ice formation and even if the pond’s surface is covered with ice, an aeration system will still deliver oxygen into the pond. Pond Talk: How is your pond faring during these extreme frigid temperatures? If your pond has been totally frozen over for a day or so, your fish will be fine. But if it has been more than a few days or weeks, your pond pals could be at risk of oxygen deprivation or overexposure to dangerous gases trapped beneath the ice. With several more months of winter ahead of us, it’s not too late to add a de-icer to your pond if you don’t already have one. Simply place a unit, like the K&H Thermo-Pond De-Icer, on the ice and turn it on. It will heat up and melt through the ice – as long as temperatures aren’t too extreme! Q: My pond froze over. How do I get it open again? A: Brrrr. Jack Frost, Elsa and the rest of the cold-weather crew sure have been busy lately, haven’t they? 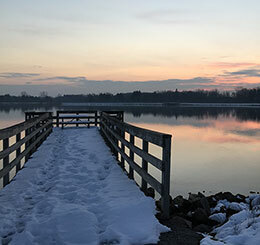 Despite the use of a de-icer, aeration system and other ice-prevention tactics, long bouts of frigid temperatures and wind-whipped nights can cause ponds to freeze over. And that’s not good news for your fish. So what can you do? When considering your hibernating finned pals, time is critical. Too long without an open area in the ice for gas exchange could mean dangerous conditions for your koi, goldfish and other pond fish. If the pond has been frozen over since last night, your fish should be just fine. Cold, windy nights often cause extra layers of ice to form on the pond’s surface. If your de-icer and aeration are on and functioning properly, some of the ice should melt on its own. Meanwhile, your fish will have plenty of dissolved oxygen in the water to tide them over. If it’s been a week or longer with no hole in the ice, it’s time to take some action. Without a hole, ammonia and other noxious gases are unable to escape into the atmosphere, and your fish will have no access to fresh oxygen. Here’s what to do when ice overtakes your pond. Melt It: First, melt a hole back open in the ice by pouring a bucket of hot water onto the frozen stuff near your de-icer or aerator’s airstones. Do not drill through the ice or bang on it with a hammer as this will stress your fish, which are probably already stressed out. Systems Check: Once a hole is open, check to be sure your de-icer and aeration systems are still running and functioning properly. If not, repair the damage or replace the unit altogether. The PondAir™ & Thermo-Pond Combo, which is an all-in-one aerator and de-icer, works to keep a vent open in ponds up to 2,000 gallons. See the video below for tips on installing the PondAir™ & Thermo-Pond De-Icer Combo. Reposition Airstones: Finally, if your airstones are positioned at the bottom of your pond, relocate them. Put them in a shallower area that’s closer to the water surface. This will create more movement – and that means a bigger hole. Should frigid temperatures and a solid ice sheet persist, take a daily trip to your pond to check on the gas exchange hole. Your aerator and de-icer should do the trick, but be ready to melt through the ice if needed. Pond Talk: How often does your pond freeze over in the winter?